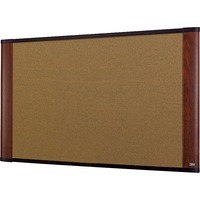 Standard cork bulletin board is made with graphite blend cork for a professional appearance. Dense fiberboard backing is sealed to resist warping and reduce moisture absorption. Design features a wood finish frame. Corkboard includes Command Strip to mount for easy installation.